The handsome assembly room in the Town Hall was on Saturday utilised as a Masonic Temple, and within its walls was witnessed a ceremony unique in the history of Freemasonry in the North of England, fully 500 brethren of the Order, a number of them of the highest rank attending to take part in the Consecration of the Lilley Ellis Lodge, No. 3236. The lodge has been named after one of the most enthusiastic and distinguished Masons in the Province of Cheshire, W.Bro. Lilley Ellis, P.A.G.D.C. of England, as some recognition of the immense and untiring work he has done for the charities. The ceremony of Consecration was performed by the Hon. Alan de Tatton Egerton, Vice Lieutenant of the County of Cheshire, and Right Worshipful Provincial Grand Master of the Province of Cheshire, assisted by Sir Horatio Lloyd, K.C., his Deputy; the Wardens of the Province, W. Bros. Geo. Ibeson and George Kershaw; the Deputy Director of Ceremonies, W.Bro. G. W. Haswell; and the Provincial Grand Chaplain, the Rev. Dr. Chetwynd C. Atkinson. Grand Lodge was represented by W.Bro. his Honour Deputy Judge John Strachan, K.C., the Grand Registrar of England; W.Bro. J. Morrison M Leod, P.G.S.B (Eng. ); the Secretary of the Royal Masonic Institution for Boys, London, W.Bro F. Broadsmith, Assist. G. Reg. (Eng. ), and Prov. Grand Sec. of Cheshire. The Province of West Lancashire was represented by W.Bros: Geo. Barclay, P.P.G.W., Commander M’Nab, P.P.G.W., T. J. Jarman, P.G.T. ; L. Peake, P.P.A.G.D.C., and about twenty other Provincial Grand Officers. The Province of Cheshire was represented by all the present officers, the past officers including W.Bro. James Cookson, P.P.G.W., the present Chairman of the Province, and about 100 others. 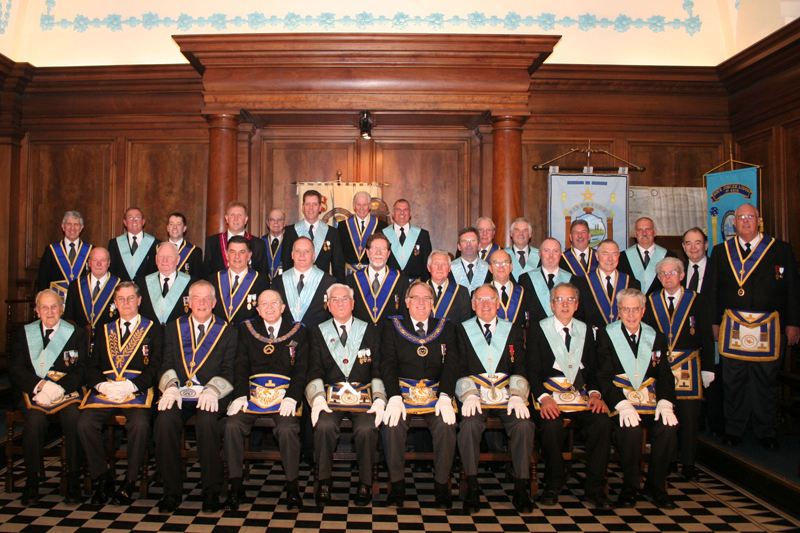 A large number of Masters, Past Masters, in all about 700 brethren were present. In connection with ordinary public life, the ex-Mayors of Birkenhead were represented by W.Bros. T. Shaw, P.P.G.W. and E.G.Mason; W. Bro. W.Getley represented the Borough Bench; and the Town Council was represented by W.Bros. T. Myers, Bros: A. Bloom, W. M. Furnival I and A. Blaylock. The lodge room was tastefully decorated with flowers and evergreens, the beautiful crimson and gold drapings and floor coverings being the work of Bro. Philip Liverman, and the handsome lodge furniture was kindly lent by the Master of the Warren Lodge, 1276. 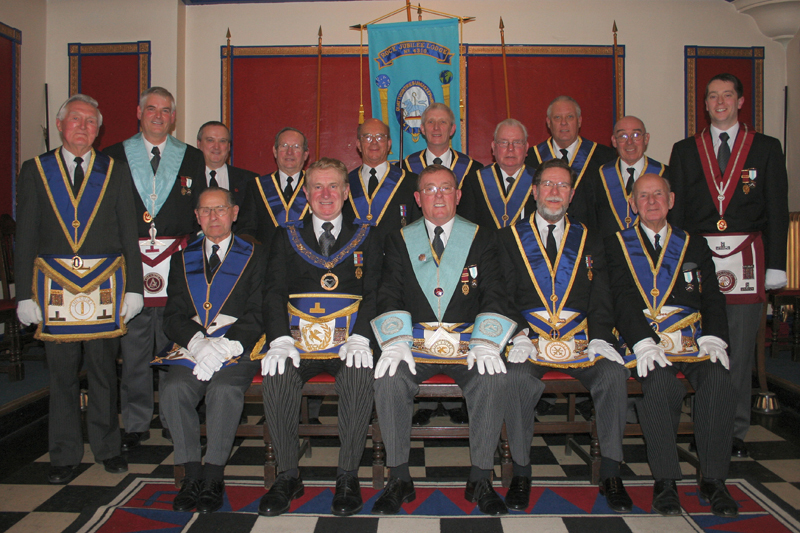 The arrangement of the lodge-room was entirely carried out under the able supervision of W.Bro. James Hamilton Jackson, P.G. Organist. When the Grand and Provincial Grand Officers marched into the Chamber the effect was brilliant in the extreme. The Warrant of Constitution was read by the Grand Registrar of England, and the quaint ceremony of Consecration was both interesting and impressive. The whole work of formation of the Lilley Ellis Lodge was undertaken and successfully carried out by W.Bro. J. Thompson, P.P.G.Swd.Br. of Cheshire, who is the editor of the only Masonic publication in the North of England, The Northern Feemason, the immense clerical work involved being considerably lightened by the active assistance of W.Bro. Joseph Clarke, P.S.G.D. The lodge had the large number of sixty founders, and the first officers are W.Bro. A. J. Thompson, W.M., Bros: Arnold Bloom, T.C., SW.; W. Pryce, J.W. ; W.Bros. J. Clarke, P.S.G.D., Treasurer; A. A. Anear, Secretary, Dr H. Keays Bentley, Asst. Sec. ; C. G. R. Stephens, S.D. ; J. Phillips, J.D. ; W.Bro. J. Hamilton Jackson P.G.O., Organist; W.Bro. W. H. Moore, P.P.G.S.B., D.C.; W.Bro. T. Vernon, P.P.G.D.C., W.L., Assist D.C.; G. F. Penny, 1.G. ; W.Bro. A. C. G. Wallace, P.P.G.D., Charity Representative; and Bros. W. Jones, T. H. Evison, P. Liverman, H. H. Crutchley, Clifford Collard, P.G. Std., and Oliver H. Edwards, Stewards. A banquet was afterwards held at the Woodside Hotel, when 150 guests were present. After the loyal toasts the Hon. Alan de Tatton Egerton, in graceful terms, proposed the health of the Master, afterwards presenting to W.Bro Lilley Ellis an illuminated address on behalf of the founders, the text of which was composed by the Master, W.Bro. J. Thompson, and executed by Bro. J. Orr Marples. During dinner the members of Bro. Johannes Kok-Alblas’ Orchestra rendered in a most artistic manner a charming selection of musical items, adding greatly to the pleasure of the evening. W.Bro. James Hamilton Jackson made an excellent accompanist.